I have been a Boosted V2D+ commuter for about 10 months, and racked up over 1000 miles on Boosted. I purchased a Meepo as a backup for the commute, which is absolutely necessary when the eboard is your main mode of transportation and the next option is a huge hassle to others in the family. I received Meepo on 8/8 and have ridden it quite a bit since then and would like to share my thoughts, experiments, and plans. 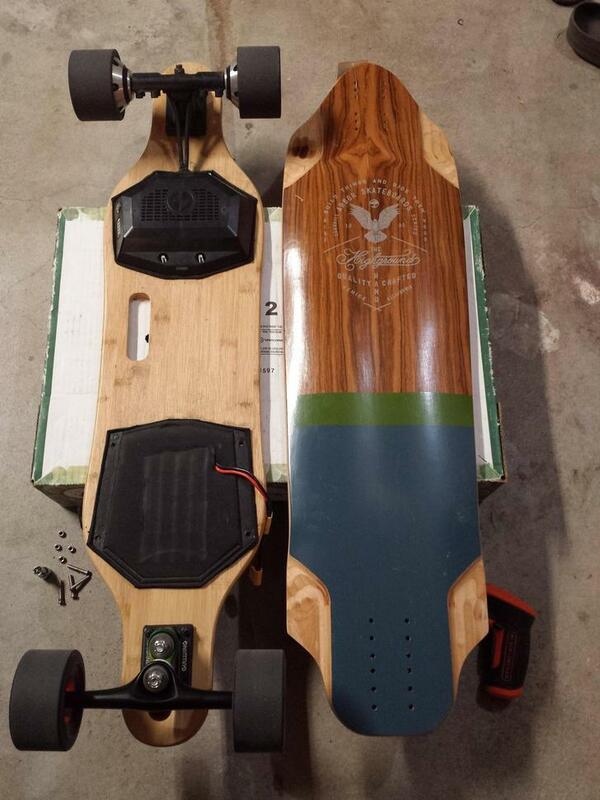 However, please keep in mind how I ride and what I need in an eboard could be different from yours. I do full throttle 90% of the commute. So, YMMV. 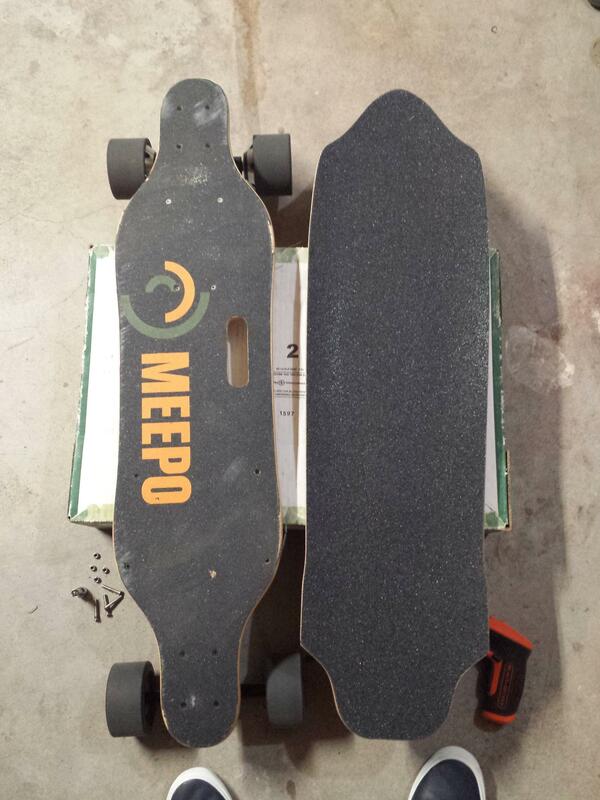 With that said, when I first rode Meepo, what impressed me right away was how torquey and powerful its motors were. Although it doesn’t have the absolute smoothest control of Boosted, it matched the well-known Boosted in the torque (acceleration) and top speed. For the price it was simply awesome! Then a critical disappointment sneaked up rather quickly. This awesome riding experience didn’t last long. For me, who cruise between 19-22mph routinely, the usable range ended before it reached 4 miles. After that, its performance decreased significantly and rather quickly. When that happens with beeping (1,2,3,..), hill climbing will kill the battery in no time. But, the top speed can be maintained for somewhat longer. This shows the characteristic of these motors. When pushed they’ll go fast, but they demand a LOT of power (~voltage x amperage). 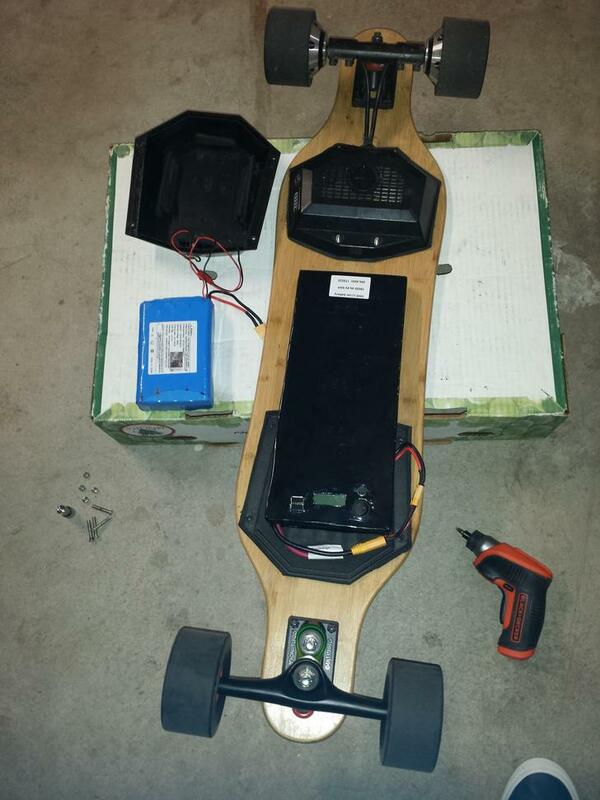 I haven’t measured the real voltage sagging on Meepo battery but I can tell you it’s huge. This is not always a problem if most of your ride is pretty tame, say cruising flat at 15mph, but if you pin the throttle as much as possible or any extended uphills are involved, the usable range becomes less than 4 miles. This disappointment became a desire to fix it. I looked for a way to upgrade the battery to prevent the voltage sagging as much as possible and extend the awesome performance as long as possible. At the same time, I wanted a fix that preserves the ESC+motor+controller integrity for simplicity. I have used the same ESC on my Blink S2 for months and it is a reliable performer. So, even though I’ve had many thoughts on VESC and FOCBOX, I wanted to keep the ESC and motors the way it is. What I wanted was 12s voltage without making the board too bulky and heavy. ESC+controller behavior is exactly the same as when the regular battery pack is fully charged. Twice in the middle of a hill climb the ESC gave up but quickly reset itself and I continued the climb. This was a rare occurrence on first test and haven’t seen it since. When the battery is fully depleted its BMS will shut the battery off and the board suddenly loses all power. But, at this point you better be aware of the imminent death. As expected, at 100% charged, there is no brake. And the higher capacity battery pack means the period of this brakelessness is longer. Thankfully the battery pack has precise % indicator. This is not unmanageable but was a surprise how long it lasted. The performance is incredible!!! I get the fully charged Meepo performance basically the whole battery. Due to higher voltage throughout. And the battery capacity is larger (158 WH vs 266.4 WH), thus much better range and each of miles is virtually unaffected from voltage sag! Even with the 12s2p Samsung 30q cells there is voltage sag (usually ~10-max 24%) but even at the lowest point of sag, there is near full power LOL!! I measured the range several times in a variety of riding conditions and for my type of riding I could get 11.5 miles of near full performance (~18mph avg). After that it travelled another 1.5 miles (~10mph avg) before dying. My usable range increased from ~3.5miles to ~11.5miles. That’s over 3x improvement! I speculate for more relaxed riding (~14-16mph avg), the range will be closer to 18-20miles. The battery pack is expensive ($360 shipped) but it includes power switch, BMS, battery meter, charger, and enclosure that could house the Meepo ESC. My initial adaptation of the 12s2p battery pack has been a massive success. All I have left is waiting for a black motor (a red motor was accidentally sent) and permanently mounting the new battery pack and ESC into the enclosure and onto the Arbor highground deck. Hope you guys enjoyed this!